Using himself as a study and social mores as the base for his jokes, a 38-year-old Arab-American comedian turned in a rollicking performance that had the audience standing up and cheering for his stand-up routine. 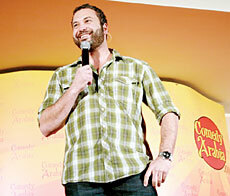 Ahmed Ahmed came from California to perform his stand-up comedy in Riyadh and Jeddah. When he left Saudi Arabia, he had conquered the hearts of the people who were lucky enough to have witnessed his hilarious performance. It was not just Ahmed who stole the show last week with his humor and satirical jokes; the local talent matched his sterling effort with its own unique blend of comedy that gave the whole act a distinct flavor. “About 10 years ago, I wrote in my journal that I wanted to travel around the world to do stand-up comedy and I wanted to do big arenas. Now I’ve performed in Saudi Arabia in front of almost over 2,000 people in three venues and the shows were electric. Out of all the countries that I’ve performed in, Saudi audiences were the best by far, the most explosive, electric audiences,” said Ahmed in an interview toward the end of his third and last show in Jeddah after performing twice in Riyadh. Born in Egypt to conservative Muslim parents and raised in California, Ahmed said he aimed at dealing with negative stereotypes against Middle Eastern and Muslims, especially in the post 9/11 world, by telling jokes. Ahmed said he expected people to say that his act was too pushy, too close to the edge or “haram.” To his surprise, the audience was very accommodating and receptive. “I was pleasantly surprised that the Arab Muslim audience is very accepting. I don’t think anything I said was out of balance. I thought I stayed within reason. I look at Islam as a pendulum that swings back and forth. I try to maintain a middle ground for my own sanity and for the evolution of religion,” he said. He also said that because we are in an era looking to the future, there is a gap between our religion and lifestyle and that’s where the struggle is. “I know I’m not perfect but I don’t lie, I don’t cheat, I don’t steal. I try to give zakah, I went to Haj and I think a lot about the Qur’an. I respect my religion. The ideology is how you maintain your deen (religion) and still have a modern lifestyle,” said Ahmed. Arab News attended the performance that took place in Jeddah. Men and women of all ages were vibrant and the hall resounded with giggles which occasionally reached a crescendo of booming laughter, whistles and ringing applause. Around 800 people attended the show in Jeddah. The first show in Riyadh sold out to over 900 and around 450 people attended an extra show to cope with Riyadh’s demand for Ahmed’s comedy. Khaled Masry, a 23-year-old marketing intern, said that he was impressed with the Saudi talent. “The show was really beyond my expectations. The Saudi comedians were impressive,” he said. Maha Akeel, managing editor of The Journal, the print magazine of the Organization of the Islamic Conference, said she had not expected to see such an event taking place in Saudi Arabia. “I don’t see why these things are restricted or banned. Why don’t we have more open social events like these? It’s normal and it should be encouraged,” said Akeel. She added that laughter was a healthy way to destroy stereotypes and to promote better communication. “We need entertainment to become part of our social life,” said Akeel. Mohammed Saeed, a 24-year-old college student, said that the show was excellent and he had expected Ahmed Ahmed to be great, but he was truly amazed by the talent of the other local comedians. Nada Al-Hashimi said that people who are keen on attending similar events must have a certain level of open-mindedness. “Not everyone is ready yet for such jokes. Personally, I know if it happened again, I wouldn’t miss it,” said Al-Hashimi. Peter Howarth-Lees, Director of Smile Productions and producer of the entire event, chose the local comedians who performed on stage with Ahmed Ahmed. They held auditions in Riyadh and Jeddah a week prior to the show with some hopeful candidates traveling from Alkhobar to attend. Twenty three amateur stand-up comedians auditioned in Riyadh and Jeddah and thirteen were chosen to accompany Ahmed on stage. The lucky 13 included Saudis, Pakistanis, a Yemeni, a British and an Irish-Sudanese. “For the auditions in Jeddah, we were honored to be hosted by the Angawi family in their Al-Makkawi Cultural House. I was amazed by the talent because most of these comedians were not prepared and had never performed before an audience. We gave them all a little coaching and advice on content suitability and they all shone like stars,” said Howarth-Lees. Khalid Khalifa, 30, who works in marketing and one of the local performers, said that communicating ideas to the customers is similar to stand-up comedy. “I love making people laugh. Anyone, anywhere, even strangers. My experience with Ahmed Ahmed was a great learning opportunity. The response from the audience surprised me and people said our show far exceeded their expectations,” he said. When asked if there were famous stand-up comedians he admires, Khalifa said there were many. “I already have famous stand-up comedians I look up to, some of them I have to because they are taller than me! Ahmed Ahmed is one of them,” he said. Khalifa was asked if putting together a stand-up comedy show like this would open the door for similar events to take place in Saudi Arabia and he said he believed that it would. “Who wouldn’t want to laugh? This is our aim and goal. When you say similar events, all I can think of is a public theater, where there are actors on a stage performing in front of a live audience. I believe that could happen,” said Khalifa. Rehman Akhtar, a 45-year-old employee of Aramco based in the Eastern Province, has a passion for stand-up comedy. After performing with the group and Ahmed, he said he felt they had made history in Saudi. “In a sense, we made history. I really do hope things open up. This is fun, good family entertainment. I was also impressed by the talent and very impressed by the quality of the show,” said Akhtar. Fahad Fatani, 27, said he had auditioned for the fun of it. He did not expect to be chosen to actually perform. “I was surprised. I didn’t prepare any material. I improvised. I plan to explore stand-up comedy more deeply now,” said Fatani who is starting his own video gaming company. Omar Ramzi, 25, was encouraged by his friends to go to the audition. When he tried practicing, he said it was horrible. “My friends told me you’re funny and you make everybody laugh. When the opportunity came, I had to take it. I was surprised to learn that I was one of the funniest people who auditioned,” said Ramzi who works as an English teacher. He described the experience as “overwhelming” and said that he would love to see social events of this sort taking place more often in the Kingdom. Howarth-Lees, who spent countless hours without rest and sleep in preparing the shows, told Arab News that he did not mind the trouble. “I’m following something I’m passionate about: Theatrical entertainment,” said Howarth-Lees. “The idea of comedy is to make people laugh but it’s something deeper than that. It’s to bring people from different cultures together to explore and break stereotypes and promote cultural dialogue. It’s a time when dialogue between different cultures, faiths and nationalities is more important than ever. So why not use comedy as a medium to make it happen?” said Howarth-Lees. When Howarth-Lees first came to the country 11 years ago, he joined two theater groups that existed in Riyadh then: Theatre Go Round and Desert Rose Arts Group. “Theater has existed within the expatriate community since the 1960s in Riyadh but was exclusively for non-Saudi performers and audiences. When I started getting involved as a director and a producer, I got Saudis involved. I felt it shouldn’t be exclusive, since many Saudis speak English,” said Howarth-Lees. In early 2008, he decided to set up his own production Company to produce dramatic and comedy theater. This was inspired while on a trip to Dubai, where he met Tom Todoroff, a voice and acting coach for some of Hollywood’s best actors. “I brought him to Riyadh to hold a workshop in June 2008 and we created history there; the stand up comedy shows are another historic milestone,” said Howarth-Lees. Last year, Howarth-Lees put together three successful comedy shows in Riyadh before meeting Ahmed in Bahrain last December. “A few weeks later, I was in Rafah during the war on Gaza, producing a documentary for channel KSA2 on the humanitarian crisis, when I received a call from Ahmed saying ‘I’d like to come to Saudi Arabia, Let’s make it happen,’” said Howarth-Lees. The success of the show put on by Ahmed and the local comedians is likely to pave the way for new ideas to see the light. “We thought it would be great to find local talented amateurs within the community and we wanted to invent something like American Idol which could appeal to Saudis. We came up with this idea that is still being developed, Saudi Comedy Stars. That is to have people audition and then go on stage with imported professionals,” said Howarth-Lees. Today the local talents are beginning to rock the local stage, but soon they could go international and help to present a positive Saudi image. Comedy workshops will follow and help to nurture and inspire local talent, “You will see Saudi-based comedians playing on stages in California and other parts of the world by the end of this year. That is going to happen, Insha Allah,” Howarth-Lees said.